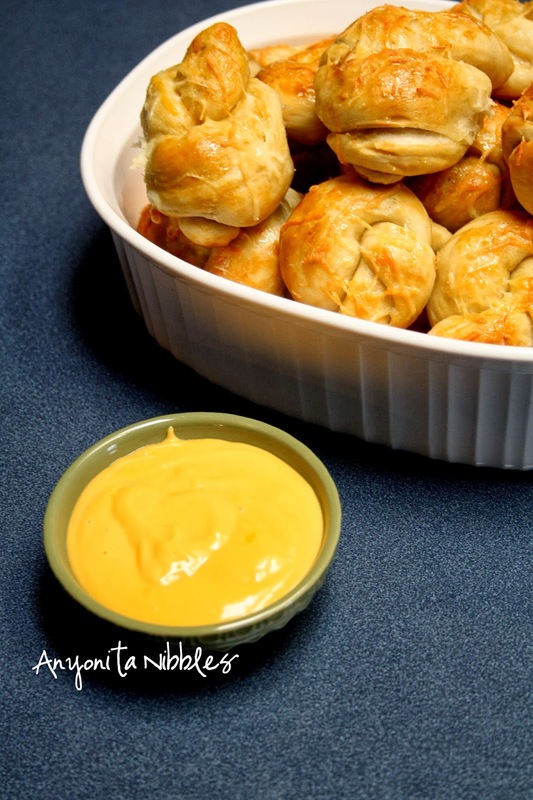 These warm and buttery homemade soft pretzel knots are topped with shredded cheese and served with a cheese dipping sauce for a decadent and delicious savory treat perfect for any occasion! Pretzels and cheese are a match made in heaven. 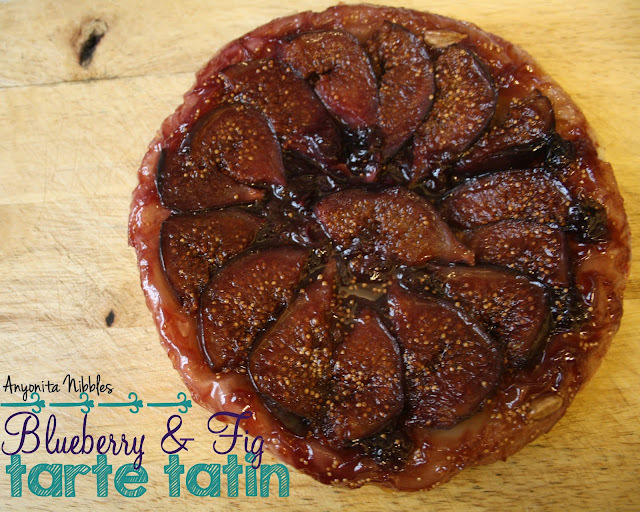 Add a dusting of sweet honey butter and you've got a sweet and savory snack that everyone will love. 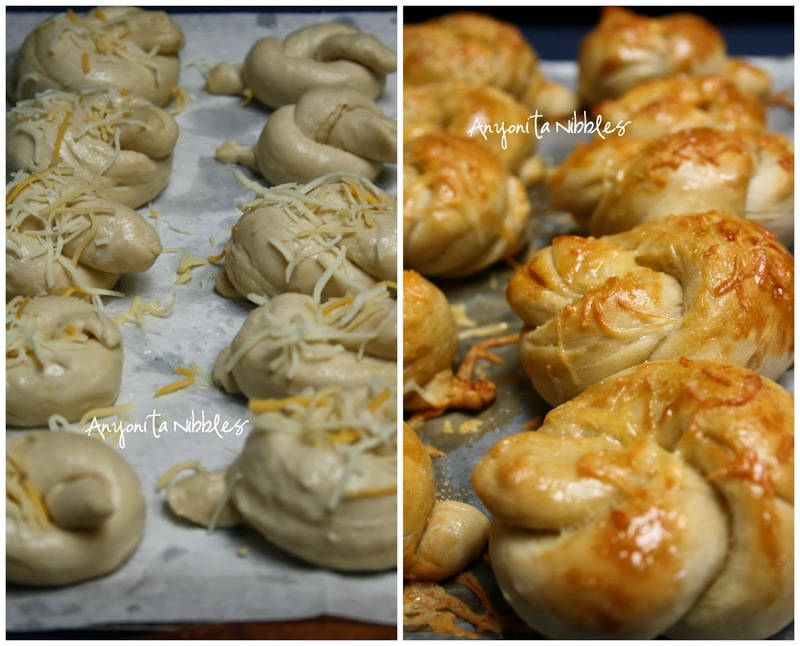 These homemade soft pretzel knots have a double serving of cheese--the first gets sprinkled on before the pretzels are baked. The second is served warm as a dip for dunking the buttery pretzel knots into. 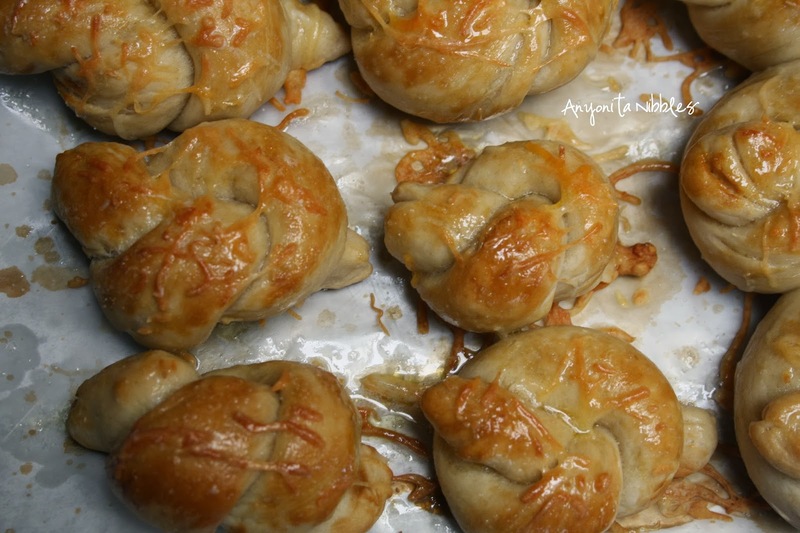 I made these pretzel knots using the recipe I shared for my sea-salted soft pretzel knots, with a few slight adjustments to accommodate the addition of cheese. Just like with those, I didn't boil the pretzels in a baking powder solution and they still turned out crunchy, flaunting the perfect pretzel texture.With the sweet butter melting into the crevices of pretzel dough, the baked on cheese providing a crunchy coating and the warm cheese for dipping into, this might be my most favorite pretzel knot recipe yet. Ignore the glittery nails. They were sparkly from New Year's festivities. Make the pretzels according to the instructions listed in this recipe. 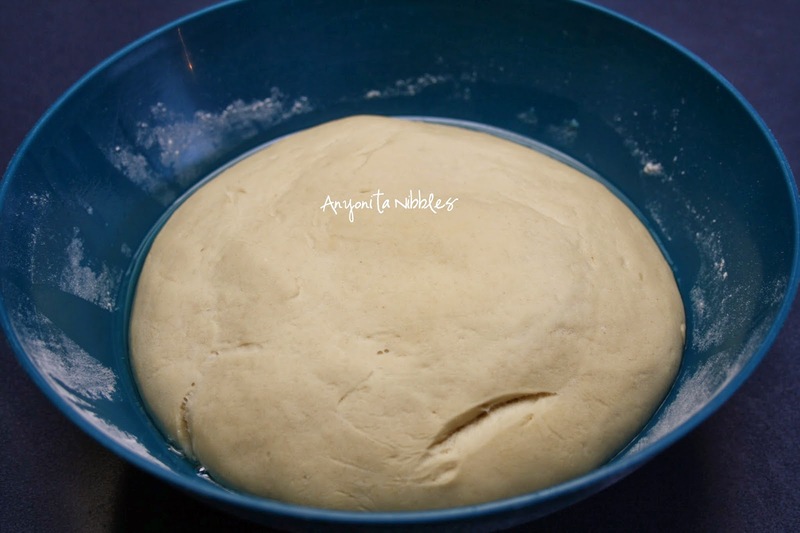 Once the dough has been knotted and brushed with the baking soda solution, sprinkle each knot with cheese. 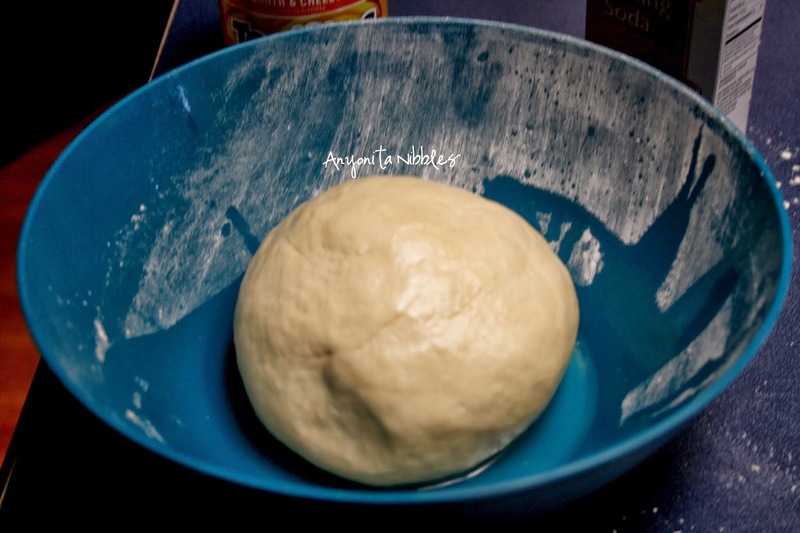 Preheat the oven to 450F/230C and cover leave the knots to prove while the oven warms. Bake the pretzels for about 8 minutes until golden brown and the cheese is melted. While the pretzels back, melt the honey butter. 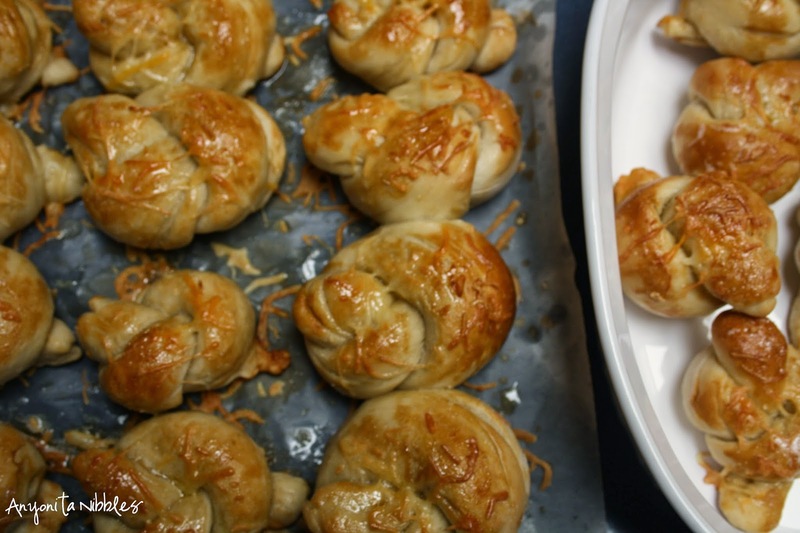 Once the knots have finished baking, brush each knot with honey butter and sprinkle with salt. Allow to cool slightly before serving with nacho cheese dipping sauce. Oh my these look absolutely heavenly, would love for you too pop over to my link party and share them for all to see. Just gorgeous! These looks incredible! I bet I could eat a whole batch all by myself!! Thanks so much for sharing on Inspire Me Wednesday. Featuring you in next week's issue. LOL, that means you HAVE to make them! :) The key is having lots of people around so you only get one or two by default because they will get gobbled up! 5 of us adults and a toddler devoured these within three hours of them coming out of the oven. lol. 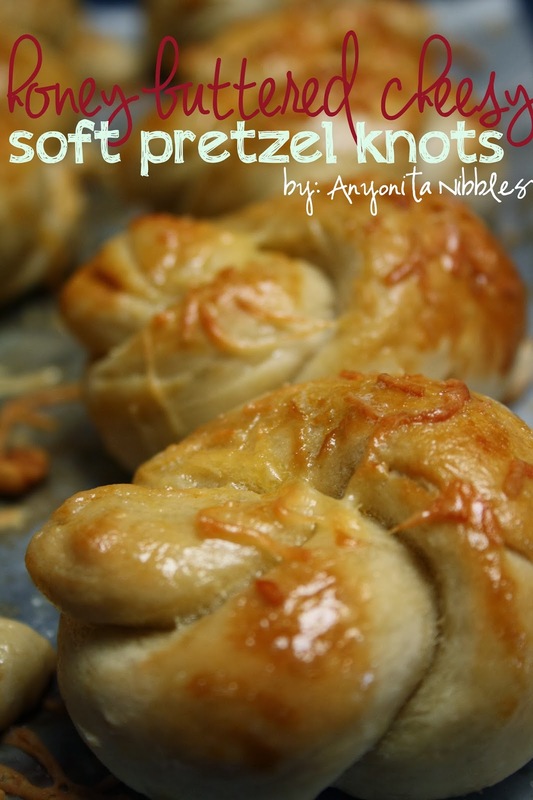 These pretzel knots have strange magical disappearing powers! 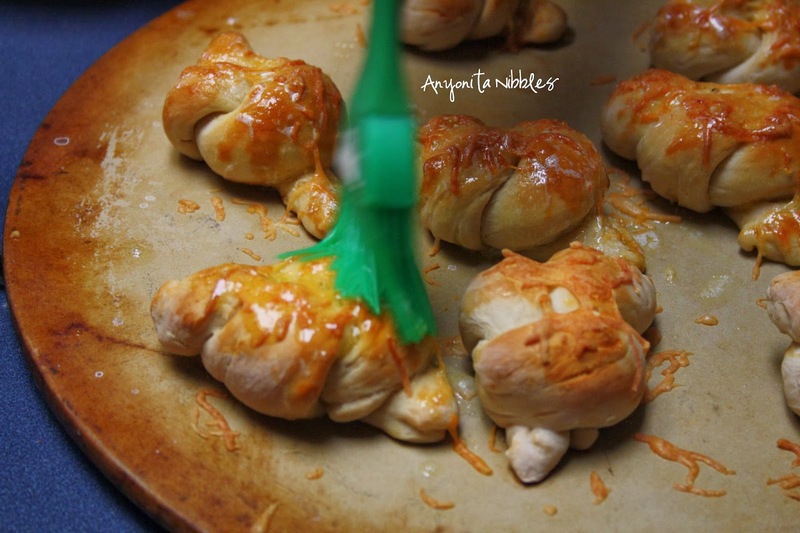 Good Morning Anyonita, Oh my word, these little honey buttered pretzels look fabulous. I could just take one off the plate to enjoy with my cup of coffee. I am certainly going to makes these. I think I will take your advice and make them when there are lots of people in the house, as I just know, if I was on my own, I would pick one, then another and another. Thank you for a lovely recipe. Oh yes, Daphne, the more the merrier with these little guys! :) I hope you enjoy them! Thanks for stopping by! Thanks so much for sharing these at The Wednesday Roundup this week. My they look delicious. 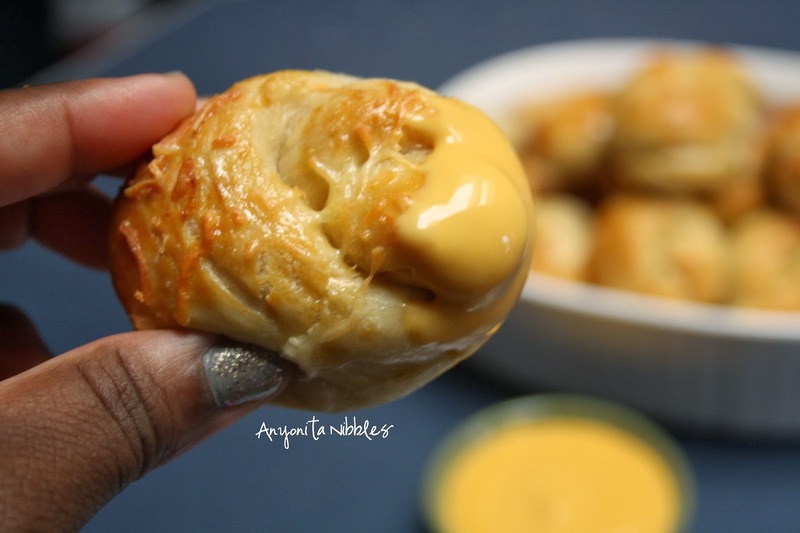 I made pretzel bites once and they sure didn't look like this! Pinning to The Wednesday Roundup board. I never thought of brushing my pretzels with honey butter. That is brilliant! It must be a wonderful sweet and salty contrast. Thank you again for sharing at Simple Supper Tuesday. 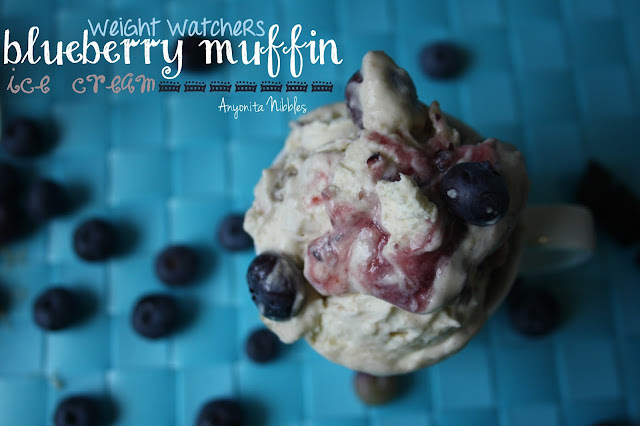 I developed this recipe when we were in NC visiting my parents. We can't get honey butter here in the UK & I was putting it on everything, trying to get my fill before we left! Lol. :) Thanks for stopping by! These look amazing. I love soft pretzels. 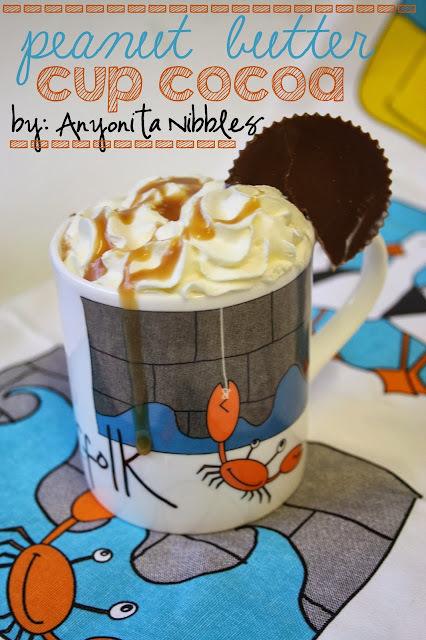 Pinned and definitely making these today! Thank you! Thank you for the pin, Kathleen! Hope they turned out yummy! These pretzels look great! Even better with cheese than the usual pretzels. :) I'll have to give them a try. Oh, give them a shot, CJ! :) You'll love them, I'm sure! Oh my goodness. Wow is about the only thing I can say. I must try these! I have to say, I love the fact that the baking soda solution is just brushed on before baking, instead of immersing them in the bath. Your photos make these look mouthwatering!! These look delicious! I love the double cheese whammy, you can never have too much cheese! My boys would love this. Pinning and sharing!